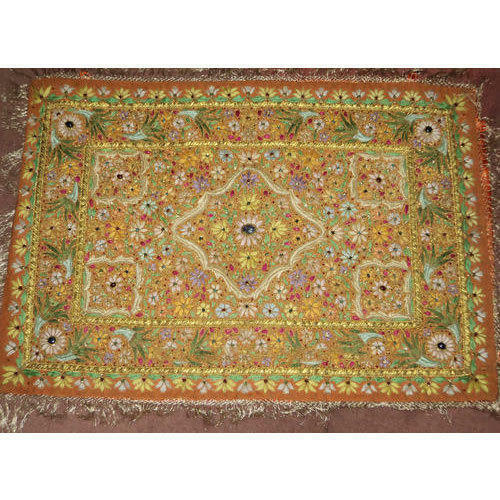 Absolutely Exquisite 100% Handmade Kashmiri Jewel Carpet / Rug / Wall Hanging with Semi-Precious stones and amazingly intricate Hand Embroidery in silk threads, from Kashmir India. This spectacular piece of workmanship & skill is an amazing collage of extremely fine hand embroidery accented. It transform your table, floor or wall with the royal grandeur of Indian culture. This is a great gift for a loved one and a genuine Collector's item. Never seen in any major departmental store in the U.S, this is a rare find & a true treasure. Don't miss this great deal. Guaranteed you'll love it.